KIEV, Ukraine -- Ukraine’s talks with Russia on the deliveries of natural gas are dragging but near a compromised decision, the Ukrainian prime minister said on Saturday. “Step by step, very slowly, but we are proceeding,” Ukrainian Prime Minister Mykola Azarov said in an interview with Ukraine’s national television. He said the talks are dragging because of the favorable conditions that Russia currently enjoys but Ukraine seeks them to be revised. “Russia enjoys an extremely beneficial deal, and Mr. Alexei Miller [the head of the Russian energy giant Gazprom] has recently called the deal as beautiful. 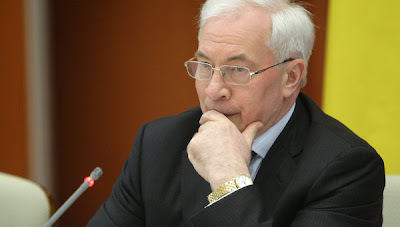 Whereas the deal is beautiful for them [Russia], it becomes a servitude to us,” Azarov said. Ukraine has long sought to alter the terms of the 2009 gas deal it signed with Russia. The contract also says Ukraine must import no less than 33 billion cubic meters of gas from Russia. Kiev wants to reduce both the price and the volume of gas imports. In the fourth quarter of 2011, Ukraine is paying $400 per 1,000 cu m for Russian natural gas.